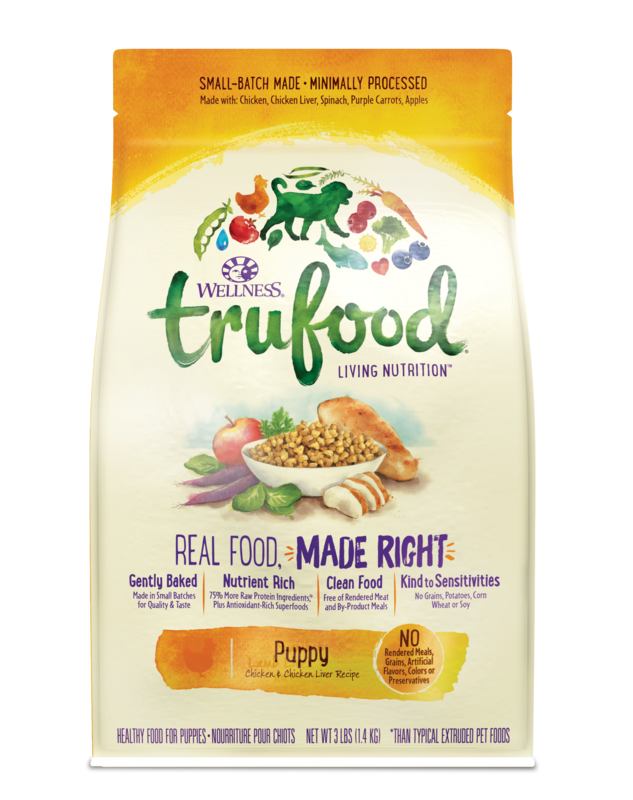 Wellness TruFood Dry Puppy Food is real food made right for your puppy! Our recipes are gently baked and made in small batches with high quality, raw, nutrient-rich ingredients. The result is natural, clean food that is free of rendered meats, by-product meals, grains, wheat and potatoes. Feed it alone as a complete meal or use as the base to build your own kitchen creation. OUR INGREDIENTS: Chicken, Chickpeas, Pea Protein, Dried Egg Product, Chicken Liver, Chicken Hearts, Lentils, Peas, Flaxseed, Tomato Pomace, Dicalcium Phosphate, Salmon Oil, Calcium Carbonate, Chicken Fat, Natural Flavor, Choline Chloride, Salt, Vitamin E Supplement, Zinc Proteinate, Spinach, Ginger, Mixed Tocopherols added to preserve freshness, Broccoli, Parsley, Blueberries, Kale, Purple Carrots, Niacin, Apples, Iron Proteinate, Copper Proteinate, Thiamine Mononitrate, d-Calcium Pantothenate, Vitamin A Supplement, Biotin, Pyridoxine Hydrochloride, Riboflavin, Vitamin D3 Supplement, Manganese Proteinate, Inulin, Yucca Schidigera Extract, Sodium Selenite, Folic Acid, Calcium Iodate, Dried Lactobacillus plantarum Fermentation Product, Dried Enterococcus faecium Fermentation Product, Dried Lactobacillus casei Fermentation Product, Dried Lactobacillus acidophilus Fermentation Product, Rosemary Extract, Green Tea Extract, Spearmint Extract. TruFood Puppy Chicken & Chicken Liver Recipe is formulated to meet the nutritional levels established by the AAFCO Dog Food Nutrient Profiles for growth and gestation/lactation including growth of large size dogs (70 lbs or more as an adult). 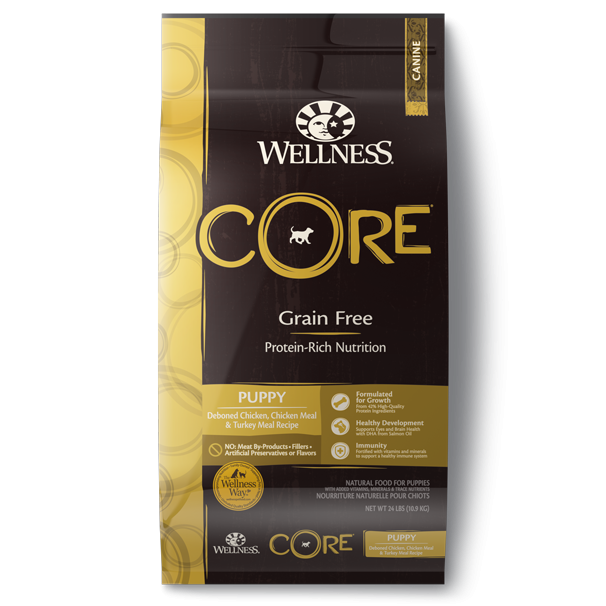 This food is formulated for puppies and pregnant or nursing mothers who have special nutritional requirements. It is important to slowly transition your dog from his/her current diet as it takes a few days for the body to adapt to new nutrient levels. To transition, gradually mix in the new food over a 5-7 day period, increasing the amount of Wellness® TruFood® each day, so that you are feeding 100% Wellness TruFood by day 7. 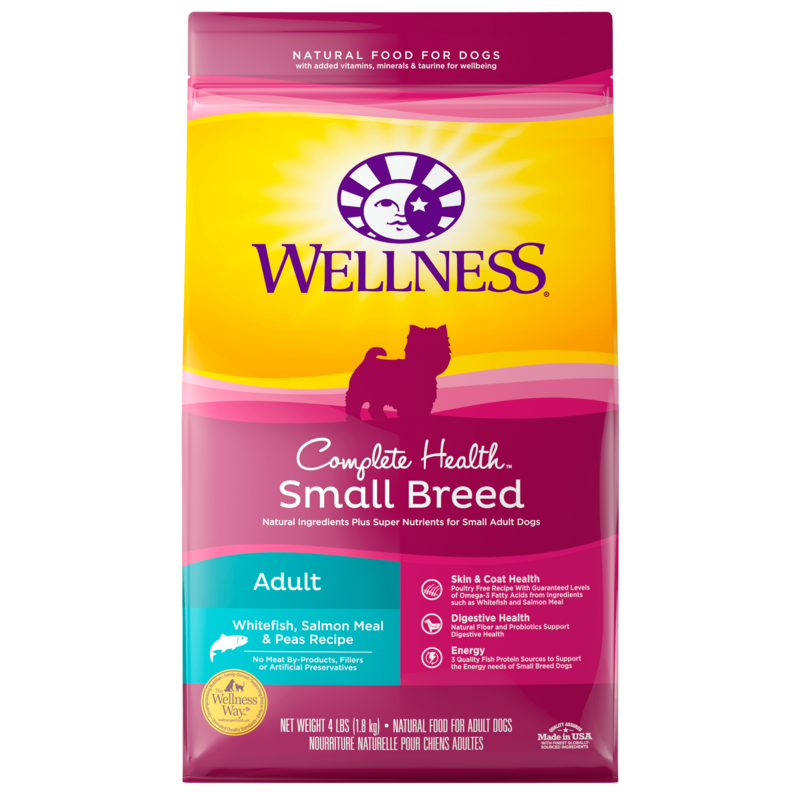 Since DHA is transferred to puppies in mother’s milk, we recommend feeding this during pregnancy and nursing. When pregnant, feed up to 50% more food according to body weight for 12 mos. For nursing dogs, allow her to eat at will. This food contains 3,837 kcal/kg or 395 kcal/cup ME (metabolizable energy) on an as fed basis.